Being promoted with the catch line 'India in Nayi Umeed', the all new unisex scooter Hero Duet has finally arrived. Available in six beautiful color options - Candy Red, Pearl White, Grace Grey, Matte Grey, Nature Green and Panther Black, the new Hero Duet scooter has been designed to impress both female as well as male riders. It now sites with the likes of Honda Activa 3G, Yamaha Fascino and Suzuki Let's scooters. Unveiled in two variants - Duet LX and Duet VX, the new scooter is priced at Rs. 48,400 and Rs. 49,900 respectively. Let's take a look at its top features. The scooter features a metal body, a telescopic front suspension, external fuel filling, mobile charging port and boot light inside the bootspace, tubeless tyres, digital analog combo meter console and an integrated braking system. 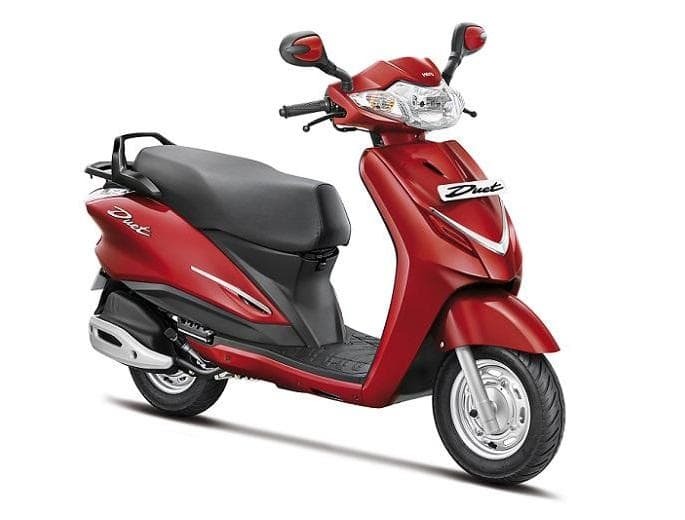 The scooter's overall weight is 116 kg and it comes with a ground clearance of 155 mm. Powered by an Air cooled, 4-stroke single cylinder 110 cc OHC engine, the bike gives a max power of 8.3 BHP at 8000 RPM and max torque of 8.3 Nm at 6500 RPM. The self-start featuring scooter comes with an automatic clutch and a variomatic drive gearbox. The scooter comes with Telescopic, Hydraulic Shock Absorber front suspension and Unit Swing with Spring Loaded Hydraulic Damper rear suspension. A 12V MF battery power the vehicle and 35W halogen headlamps light up the way for the rider. With that, we come to the end of the features highlighted by the manufacturer. Hero's previous blockbuster hit is a scooter named 'Maestro Edge' which strengthened Hero's presence in the two-wheeler scooter segment. With Hero Duet, the company hopes to capture a larger market share. What are your thoughts about the new Hero Duet's looks, features and pricing? Share with us in comments below.